With the final presidential debate over and Election Day around the corner, it’s time to think of legacies. I will remember Michelle Obama for her incredible work around food, healthy eating, exercise and children, and, of course, that wonderful White House garden. Will this legacy continue? I began to search for answers by visiting the candidates’ respective campaign websites. As you may have guessed, food and agricultural policy did not make it onto either Trump or Clinton’s “issues” section. In fact, food and agricultural policy are not high on the list of issues voters care about. The Pew Research Center found that the economy and terrorism are priority issues for voters this election, with 84 percent of voters saying the economy is very important to their vote, and 80 percent of voters saying terrorism is very important to their vote. Some other important issues include health care (74 percent), immigration (70 percent) and trade policy (57 percent). Interestingly, the implications of food policy will impact the issues voters care most about. Food and agriculture account for approximately 17.3 million jobs (about 10 percent of the total U.S. employment), and contributes approximately $985 billion to the gross domestic product of the United States. Furthermore, Americans spend a lot on food—about 12.6 percent—just below housing and transportation. In regards to trade policy, U.S agricultural exports were valued at approximately $133 billion in 2015. That’s not chump change. Furthermore, with more and more countries banning genetically modified products, our agricultural and food policies will increasingly determine which markets we will remain in, and which we will be forced to exit. Food also impacts immigration. While the number of migrant workers continues to steadily decrease, half of all hired farmworkers (laborers and supervisors) are Hispanic. Many farmworkers are U.S. citizens (64 percent), but there are quite a few noncitizens, both authorized and unauthorized. In fact, 42 percent of farmworkers are foreign-born (compared to only 16 percent of all U.S. wage and salary workers). Per the Centers for Disease Control and Prevention(CDC), approximately one-third of American adults, or 36.5 percent, are obese. It’s not just adults who are affected by obesity. In fact, the CDC estimates that approximately 17 percent of children (ages 2-19) are obese—that is 12.7 million children. It is projected that by the year 2030, 44 percent of Americans will be obese. This is a huge burden on our health care system, given that diseases associated with obesity – heart disease, stroke, type 2 diabetes – are all among the leading causes of death. In addition to the health consequences of obesity, the economics are staggering. The CDC estimates that the medical cost of obesity in 2008 was $147 billion, but that is just the cost of health care. Obesity can cause individuals to miss work, (obesity-related absenteeism), as well as be less productive at work (obesity-related presenteeism) and decreased work productivity due to obesity has cost the United States approximately $3.38 billion each year. It’s clear that food and agricultural policy are deeply connected to the issues voters care most about. So, the question remains, where do the candidates stand? Interestingly, Hillary Clinton had a small vegetable garden on the roof of the White House when she was a first lady. In terms of policy, when Clinton was in the Senate, she worked to prohibit the USDA from letting federal school lunches use chickens pumped with antibiotics. She does see a role for genetically modified foods (which is less progressive) but believes in labeling these foods (more progressive). Furthermore, she supports SNAP and even would like to increase access to fresh fruits and vegetables. Lastly, she has surrounded herself with individuals like Dr. Dean Ornish, who is known for his important work around diet and lifestyle change (in fact, he helped former president Clinton change his diet!). When voters go the ballot box Nov. 8, they will be supporting a range of policy issues, and not just the ones they feel are most important. 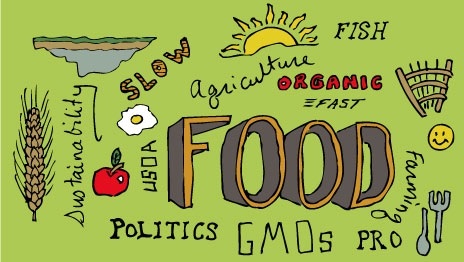 Given the interconnectedness of food and agricultural policy to the issues Americans purport to care most about, Americans should take a moment to examine where they, and these candidates, stand on food.